If you’re looking for a special treat to make for your beloved pets, look no further. We have gathered a list of pet recipe ideas that will be purrfect for your companion! These simple creations are fun and easy to make, and will sure be loved by your pups or kitties. 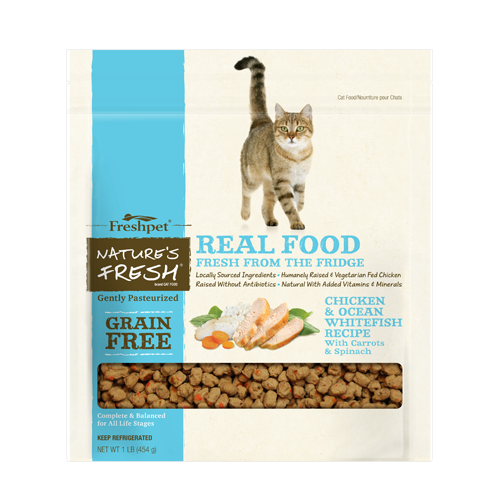 And, they start with his or her favorite Freshpet foods and treats. 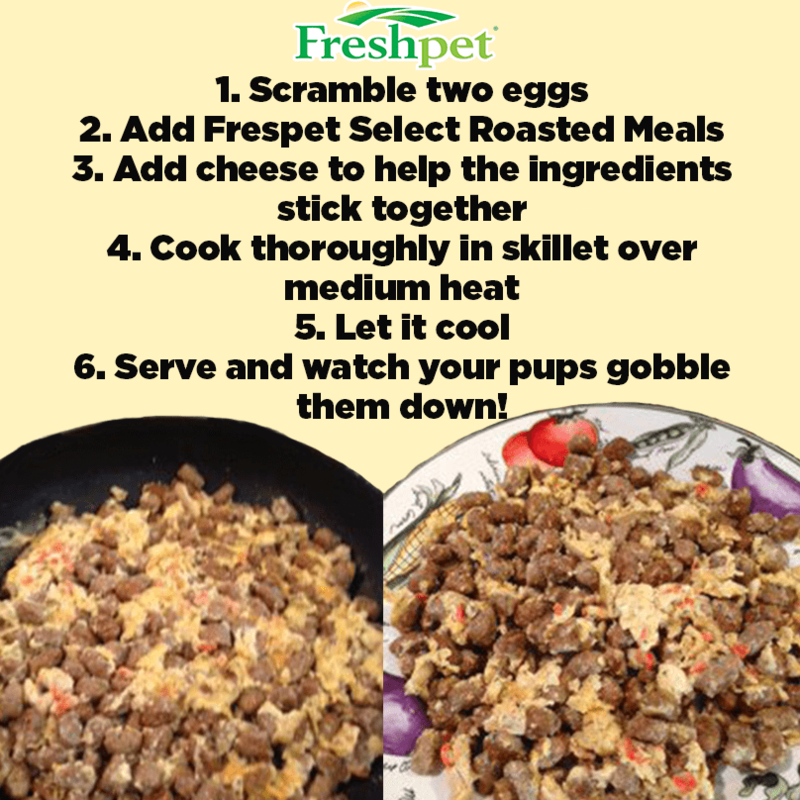 Roasted Meals Omelets Start off your pup’s breakfast the right way, this hearty meal will surely leave your pup begging for more! 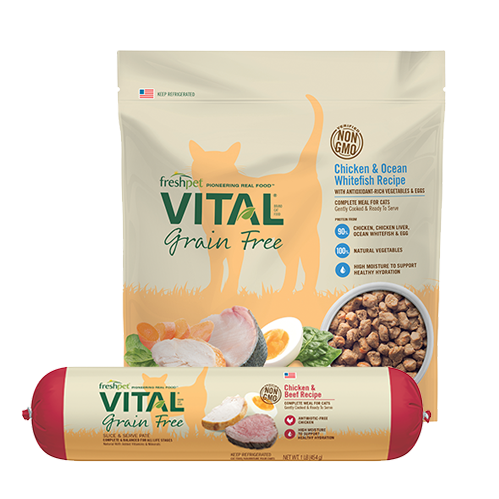 The benefits of this protein-packed meal are great for your furry one! 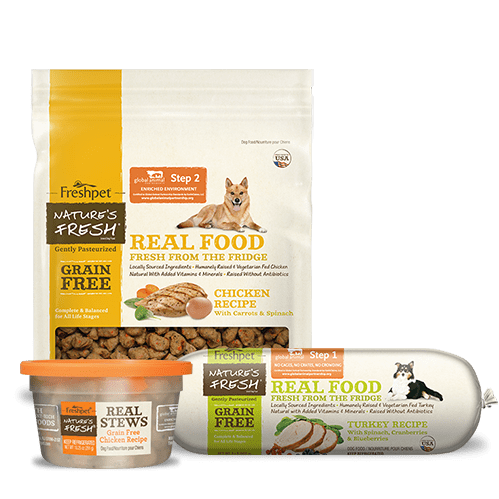 And, everything you need is most likely already in your refrigerator at home: eggs, cheese, and Freshpet Select Roasted Meals. This is a great way to spend a Saturday morning with your loved ones. Many kitties will enjoy this meal too, but be sure to skip the cheese if you have kitties with sensitive stomachs. Many adult cats grow up to be lactose intolerant. If you are not sure, give your cat a small piece of cheese to try first to ensure it does not upset his or her stomach. 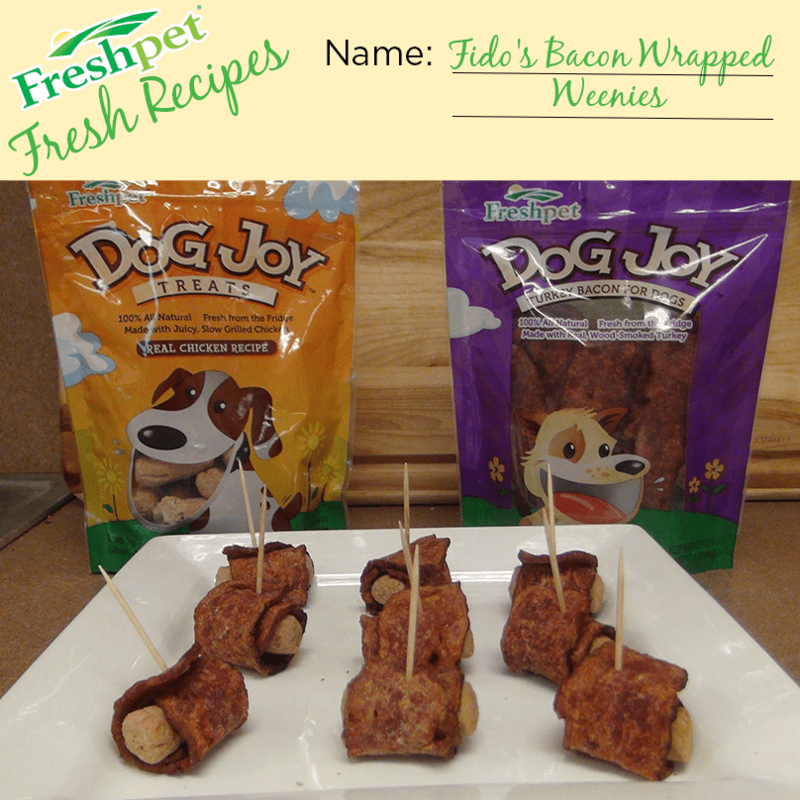 Fido’s Bacon Wrapped Weenies Get your pup in on the action during your next party! Inspired by a classic spanish tapas dish, this simple recipe only needs Dog Joy Chicken Treats and Dog Joy Turkey Bacon. Simply place the Chicken Treat at the end of the Turkey Bacon strip and begin to roll. When finished, stick it with a tooth pick to keep it together, and viola! You have a bacon wrapped weenie. Check out our Vine to see this technique in action, and don’t be afraid to get creative! 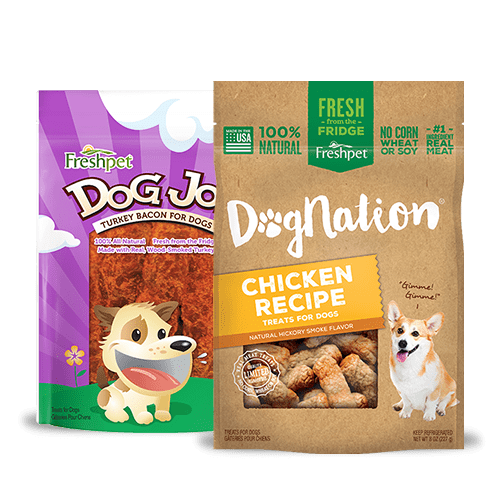 Try substituting our Chicken Treats for Dog Joy Beef Treats for a slightly different take on a great snack. This treat is a perfect little appetizer or snack for a special occasion or a pooch party! Fresh & Meaty Cupcake Create your own fresh cupcake to celebrate with your pooch! 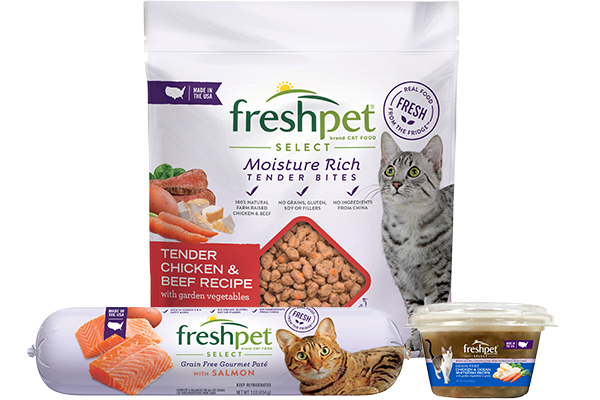 Lightly microwave the Freshpet Slice & Serve roll of your choice until soft. Then, place in a cupcake liner inside cupcake pan then refrigerate for a bit to keep the cupcake shape. Freshpet parent Yvonne C. tops hers off with frosting made of yogurt and peanut butter! Fresh Soft-Bite Cookies Are you a pet parent that loves to go above and beyond for your little ones? Then this soft-bite cookie is the recipe for you. Semi-homemade, this recipe takes baking for your pet to the next level, and we are sure there will be a stampede to the kitchen while these cookies are baking in the oven! 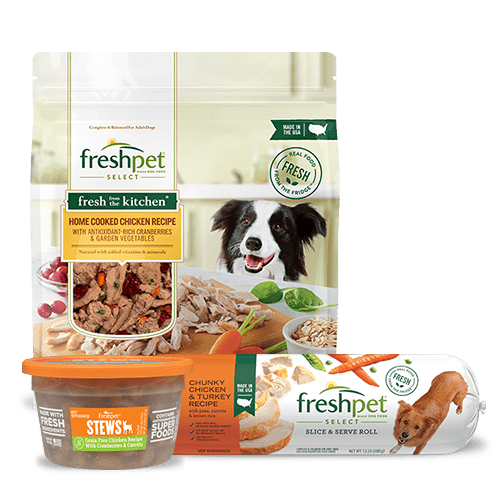 The Freshpet ingredient card is the key to your pup’s heart; it has everything listed that you will need along with the proper cooking instructions. 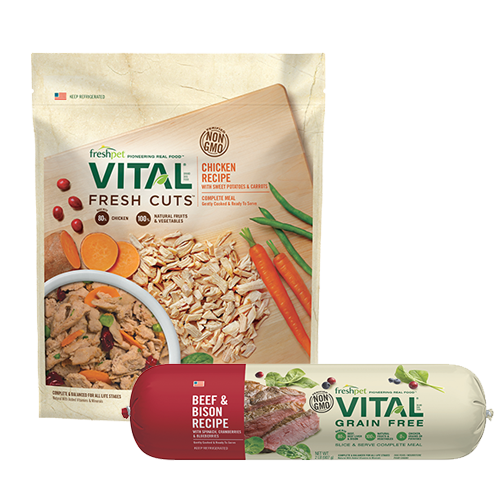 Just start with the Slice & Serve roll of your choice, mix the ingredients, and bake for a meaty, moist treat your pooch is sure to love. We hope you enjoy these fun, creative ways to spice up your Freshpet food and really treat your pets to something special. Do you have any other suggestions? If so, email us at [email protected]. We’d love to hear it! Happy cooking!